Shourya (Naga Shourya) is a gaming expert who plans to go to USA, while Divya (Malavika Nair) is a Medico. Both of them do not have plans for marriage, but their parents have other plans for them and fix a wedding for them. Upset with parent’s decisions, Shourya and Divya together plan their ways to live apart after six months after wedding. What is their plan? Will they find love in these six months and what happens to their goals forms the rest of Kalyana Vaibhogame. Naga Shourya looks handsome and he performs very well in the boy-next-door role. His comic timing, expressions and dialogue diction are impressive. Malavika Nair ably supports Naga Shourya, and they shared good chemistry. She beautifully emotes in the second hour. Raasi makes a comeback and she is elegant in her role, while Anand is decent. Raj Madiraju is impressive, while Pragathi, RJ Hemant evokes some laughs. Aishwarya is ok in her roles and others are adequate. Kalyan Koduri’s music is soulful and pleasant, and the BGM goes with the theme. Camera work by Satyanarayana Raju is grand and all the songs are beautifully shot. Dialogues are meaningful and humorous at the needed times. BV Nandini Reddy’s direction is good, but the screenplay is predictable with not much of twists or twirls. Editing by Junaid Siddiqui could have been better in the second half. Production values of KL Damodara Prasad are standard. Kalyana Vaibhogame as the title says has marriage as central point in the current generation perspective. The film however reminds you of a couple of Tollywood films like Pellaina Kothalo and Krishna Vamsi’s Mogudu in few scenes, though Nandini Reddy tried to dealt in her own way interlacing it with humour and not much of drama. 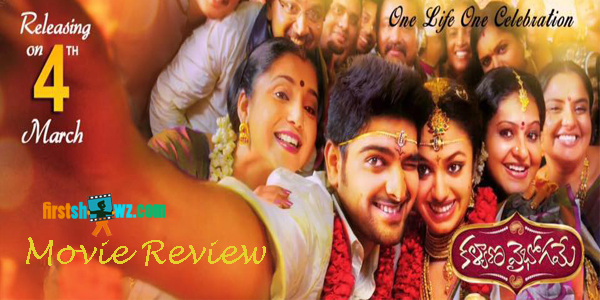 Naga Shourya and Malavika Nair are good together, and they shared a great chemistry The first half has been entertaining with interesting characterizations, and light-hearted fun on marriage. The interval block is neatly-woven but the issue with Kalyana Vaibhogame is dragging screenplay and a bit lengthy second hour. The scenes of Vaidehi were sluggish, while Nandini Reddy opted for unexciting Ala Modalaindi climax template with the entry of Thagubothu Ramesh, Ashish Vidyarthi. Nevertheless, Kalyana Vaibhogame has its moments to enjoy. It is a wholesome family entertainer with impressive writing supported by good casting and performances. Kalyana Vaibhogame- This wedding is worth a watch!